Born at Blyth, Ontario on 22 February 1865, son of William and Anne Machaffie, he was educated at the Brantford College Institute then commenced a career as a clerk in the Merchants Bank of Canada at Winnipeg in 1882. 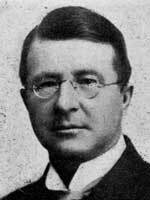 In 1911, he was manager of the Home Bank of Canada at Winnipeg. In 1888, he married Charlotte Sydney-Smith, daughter of Colonel John Sydney-Smith of Stratford, Ontario. They had two sons and one daughter. During the 1885 North West Rebellion, he served with the Queens Own Rifles and was later Captain of the 90th Battalion, retiring as Captain. He was a member of the Manitoba Club and St. Charles Country Club. His recreations included riding and golf. Conservative. Anglican. In 1911, he lived at 140 Roslyn Road, Winnipeg. Who's Who in Western Canada: A Biographical Dictionary of Notable Living Men and Women of Western Canada, Volume 1, 1911. C. W. Parker, editor. Canadian Press Association, Vancouver.